In ancient times, Indian merchants managed much of the trade in the parts of the Malay Peninsula that are now part of Thailand, including trans-shipment routes through Songkhla, and there were many Indian settlements. 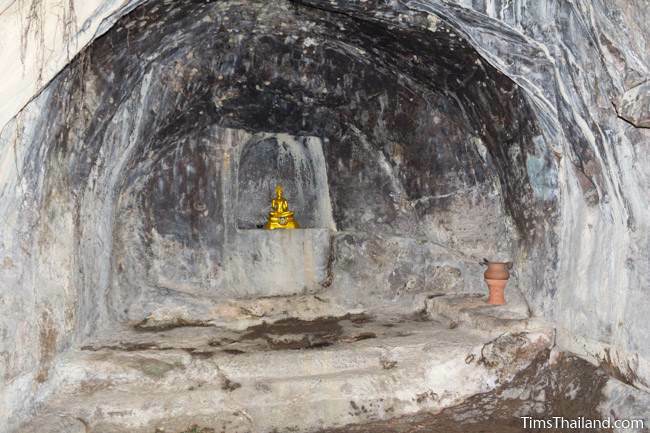 One of them was at the foot of Kao Kuha hill, between the ocean and Songkhla Lake, where two Hindu "cave" shrines were carved into an east-facing cliff. Evidence is scarce, but it's assumed that they were in use from around the 7th to 11th centuries CE. About 150m in front of the caves is Pang Phra baray (reservoir), which was dug, presumably, at the same time that the caves were carved, indicating it was a significant settlement. 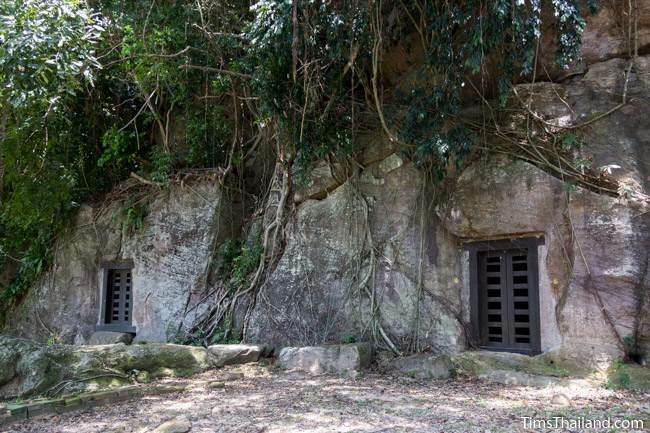 Now known collectively as Tham Kao Kuha (ถ้ำเขาคูหา), this is the oldest Hindu site in Southern Thailand and the only place in the whole country with ancient rock-hewn caves like these. Both have small doorways (the grated doors are kept unlocked), but open into fairly substantial domed-roof chambers. It's no Petra or Lalibela, but it's still pretty cool. 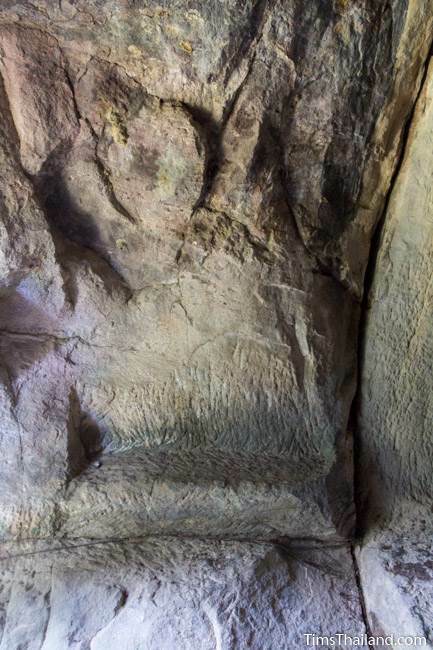 In the northern cave, steps lead up to a small altar recessed into the back wall. 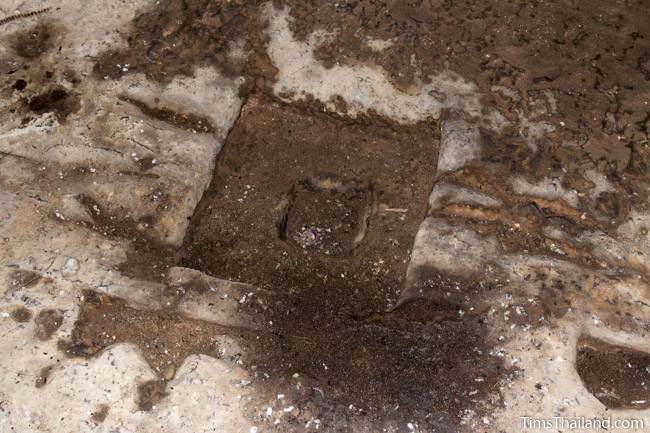 In front of it is a base for a sculpture, perhaps a Shiva linga. The purpose of the ledge with two round holes is unknown. 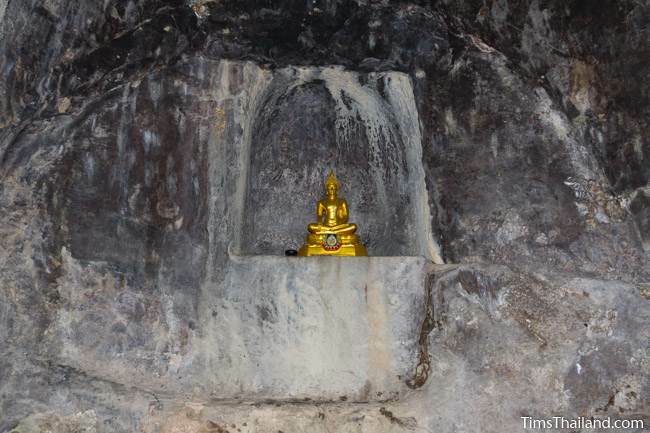 A somasutra channel (same as those found in the main shrine of many Khmer temple ruins) for draining the holy water used to bless the statue runs along the north wall and out of the cave through a small hole. 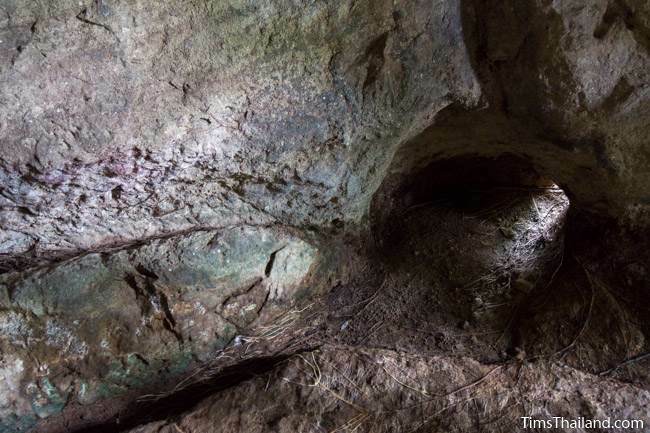 There's less carving inside the rougher southern cave, though there's an obvious platform at the back and small ledges near the front. 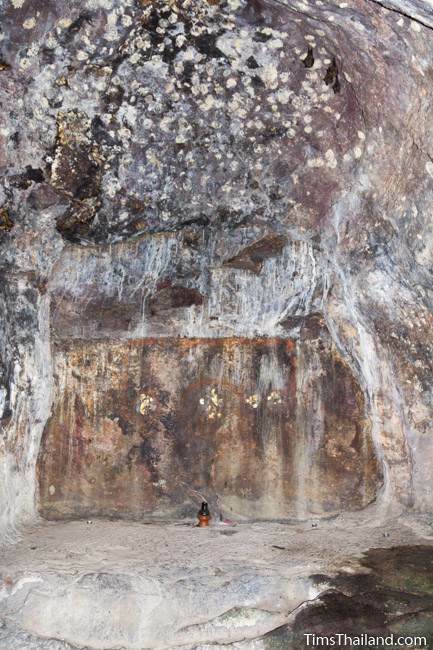 Based on what was done in India at the time, there were probably paintings inside both caves, and some small faded patches of paint remain. 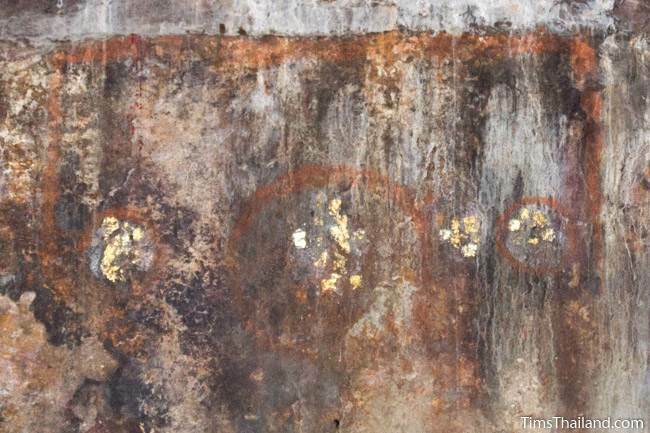 Many sources suggest that that three red rings at the back of the southern cave could represent the Trimurti (Shiva, Vishnu, and Brahma), like the well-known "Om" symbol does. Eventually the Ayutthaya kingdom came to dominate here and the caves, then called Tham Ko Hai, were used for Buddhist worship and an island in the baray was used for ordaining new monks. Possibly it was at this time that the Hindu statuary, including a Vishnu sculpture and a large Shiva linga-yoni set were smashed. From roughly 15th-17th century Muslim pirates sometimes raided villages along the coast, and they were known to destroy "false idols." 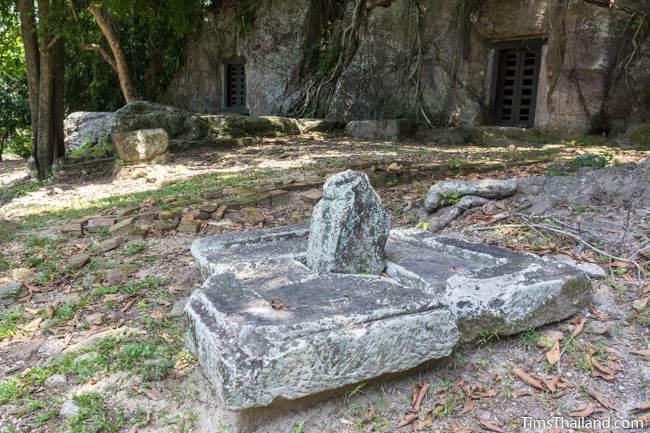 The broken linga and yoni are displayed out front, but no other old statues, Hindu or Buddhist, remain. Just south of the caves is Wat Pha Ko (วัดพะโคะ), a large and busy, though rather ordinary temple. 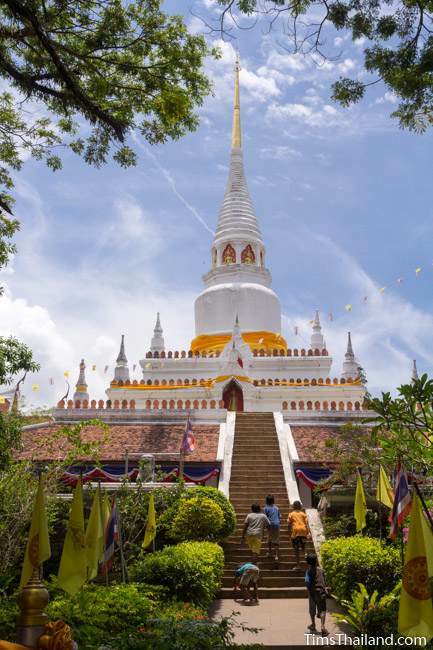 Its popularity as a pilgrimage site is due to people wanting a spiritual connection with Luangpho Thuat, one of Southern Thailand's most famous monks who resided here for a few years, rather than anything artistic or historic.